As educators and scientists, we are passionate about what we teach as well as experts in our respective content areas. So, when a student stumbles on an exam or falls short of our expectations in a project, it is hard to not wonder, "How did this happen?" We taught them, so why didn't they learn? Scientists have discovered much about learning and expertise in recent years – things that should be influencing how we teach and how students learn. In fact, helping our students become better learners might be one of the most powerful gifts we can give them. Check out Karl Wirth's great M&M Magma Chamber activity. The page includes video clips of the activity in action in a class at Macalester College. 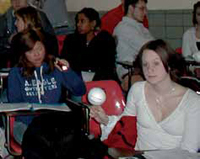 In introductory geology classrooms, students enter with varied goals but are primarily taking the course for a general education requirement (e.g., Hoisch & Bowie, 2010). As a result, we need to support learning in future contexts outside of the geosciences as well as the content of introductory geology. One skill that supports both goals is metacognition. 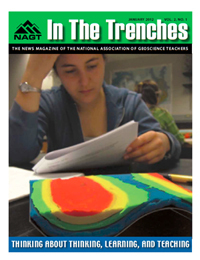 In this presentation from the 2008 Workshop on the Role of Metacognition in Teaching Geoscience, Dr. Kraft spoke about how she has used metacognition with her students to improve their understanding of the Nature of science. Her intention is to illuminate the "scientific habit of mind" and at the same time help her students attain a firmer grasp on their own habits of mind. I started college teaching in 1981 and, like most new professors, knew little about teaching other than what I had experienced as a student. I soon realized that I was in trouble — or, rather, that my students were in trouble — because I had no idea what I was doing. I prepared "great" lectures and delivered them, only to find at exam time that students hadn't absorbed what I was saying. So, after a few years of frustration, I began to read to find out what experts had to say about teaching and learning. 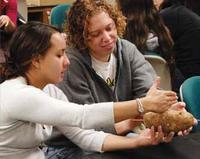 STEM research indicates that student-centered teaching strategies can enhance student learning. However, these methods don't necessarily include teaching and learning activities that take account of the emerging neuroscience research described in the previous articles by Wirth and Perkins. The Geoscience Learning Process (GLP) research group at NCSU is working on a series of projects around the general theme of how students learn. Here we briefly describe some aspects of course design intended to enhance the learning process. Faculty members know students should practice critical thinking skills. However, we also recognize that implementing such a curriculum in a general education setting can be challenging. The Earth and Mind blog aims to facilitate discussion and discovery about how humans think and learn about the Earth and environment. Earth & Mind explores the intersection between Geosciences, Education and Cognitive Sciences. The geoscientists who post here are interested in the thinking of expert geoscientists, novices, and everyone in between. They are also interested in how education shapes students' knowledge, understanding, motivations, and actions concerning the Earth. This project synthesizes existing knowledge and explores unanswered questions in critical areas of research on cognition and learning relevant to the Geosciences. It focuses on four themes: Geological Time, Complex Systems of the Earth, Spatial Thinking in Geosciences and Field-base Learning. This topical module from On the Cutting Edge provides educators with information about how students' affective response affects their learning. What is the Affective Domain? How do you address affective issues in science courses? How do educators recognize and overcome affective challenges for teaching controversial topics including teaching evolution and teaching environmental issues? These and many other useful resources are available. An awareness of the learning process can improve learning dramatically. Yet students are rarely taught how to develop this awareness. We can help our students to improve their learning by incorporating metacognition into our courses: by having them think about their thinking and by helping them to become aware of and monitor their learning strategies. This module from On the Cutting Edge provides information for faculty to help them integrate metacognitive thinking into their classroom. Many resource are available including videos of presentations given by leading educators at a workshop in 2008.